A dental crown is a specially designed covering that protects the entire surface of your tooth. A crown will strengthen and reinforce your tooth’s structure, protecting it in ways a regular filling or other types of restorations cannot. While there are many different types of crowns, including gold, tooth-coloured porcelain crowns are the most commonly used in dental practices today. Crowns are highly durable and can last many years, depending mostly on the amount of usage and they are exposed to and how well they are cleaned at home. Porcelain crowns are designed to closely match the size, colour and shape of your other teeth, leaving you with a more natural look and smile. Typically, getting a dental crown will require two appointments. Your initial visit will involve removing any decay, as well as preparing and shaping your tooth so that it can accept a crown. An impression will need to be taken of your upper and lower teeth, which are sent to a dental laboratory. 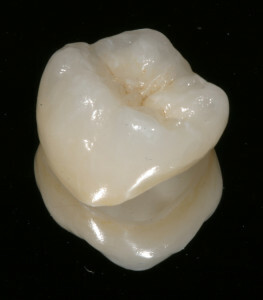 A dental crown is then fabricated at the lab and then returned to our office. After the process is complete, you are ready for your second appointment, which is usually shorter. During your second appointment, we remove the temporary crown and replace it with a new crown, which is securely cemented into place. Luckily, unlike most offices in Kelowna, we are a Cerec office which means your crown can likely be completed in one appointment. We have digital technology that allows us to prepare, image, and fabricate your crown in the office while you enjoy a coffee and watch Netflix. This process takes an extra 20 minutes but saves you the second appointment and a second injection for anesthetic. For more information take a look at our Cerec page. True to their name, dental bridges literally bridge gaps created by missing teeth. 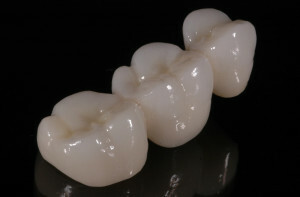 A “traditional bridge” is the most commonly used among dental practitioners, and is constructed with porcelain fused to metal. In most cases, a bridge will be placed over abutment teeth (anchoring teeth) and attached to an artificial tooth, filling any gap created by the missing tooth (or teeth). A bridge is a highly durable dental appliance and with proper care, can last up to 15 years or even longer. Getting a dental bridge is a very specialized process that usually requires 2 visits to our clinic. The two ‘anchor teeth’ are prepared for a bridge by removing a portion of enamel, enabling the placement of the dental crowns. We then take an impression of neighboring teeth and send it to a dental laboratory where a new bridge is created. A temporary bridge is installed and worn until your next appointment. During your second appointment, your new, bridge is checked and adjusted before being cemented into place.